The first edition of MB was put together in 1989 with the team plummeting towards the Vauxhall Conference, Garry Gibson was chairman and we’d just parted company with Bob Moncur as manager. Plenty of scope for a fanzine then! The late eighties had seen an explosion of fanzines for most clubs, with some having several. The idea for a Hartlepool fanzine was first mooted in a letter from Dave Shedden (who lived in Colchester) to the Mail Sports Special asking if anyone was interested in helping put one together. Dave works in the printing industry and had experience in the world of fanzines. The replies were somewhat surprising – one from Hartlepool (myself) and two more from Colchester! The two Colchester replies both lived within 5 minutes walk of Dave’s house. Spooky or what???? So, we set off producing the first issue, with editorial conferences mainly taking place in Colchester but with plenty of long distance phone-calls … something which was to feature a lot over the next ten years. 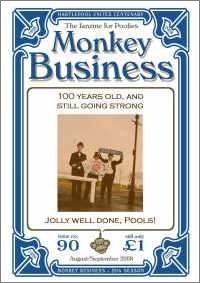 The typing was all done in Colchester, the pictures were largely badly hand drawn, the language a bit "riper" than it is now with Graeme Young taking on the mantle of editor and the pseudonym "Mervyn the Monkey". We all clubbed together to raise the printing costs and committed to an initial print run of 400. With superb timing, Pools appointed Cyril Knowles as manager on the day the copy went to the printers, so we had to hastily put together a two page insert to reflect this. Copies went on sale at the away game at Maidstone on December 16 1989. We lost 4-2, but in many ways that game was very much a turning point in the club’s fortunes. Number one sold out very quickly, and the profits funded issue two. One of the Colchester trio dropped out, but Graeme, Dave and myself put together the next twenty or so issues. The logistics did get a little more complicated when Graeme moved to a new job in Brighouse. Eventually, the pressures of the job and a new family forced Graeme to drop out too, leaving Dave and myself to carry on as joint editors. We got to issue 47, but when I took up the position as Press Officer with the club, I was forced to resign to avoid a conflict of interest. Dave, suffering from increased work commitments and the remoteness of his Essex exile felt that he couldn’t do the job single-handed, so we "head-hunted" the new team of Lol and Bob. All of the profit from sales of MB goes to the club in one way or other. 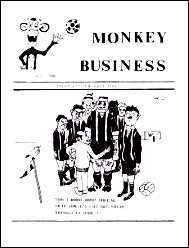 Our first commercial venture was the production of the "Monkey goes from strength to strength….like" T-shirt featuring a Mervyn the Monkey cartoon drawn by Mervyn's creator Alan Rowland. Over the years, we’ve regularly sponsored players’ kit and even sponsored matches. I reckon we are one of the very few (possibly only) fanzine to take out an advertising board at the ground. When Cyril Knowles died, we produced a special T-shirt, and sent a cheque for £200 to his widow with a note explaining the special place he held in the hearts of all Pools fans. We received a very touching reply from Betty. We also produced a special edition for Brian Honour’s Testimonial, and all of the proceeds went to the testimonial fund. During the dark days of Gibson’s reign when the player’s wages weren’t being paid we gave the lads their beer money for the annual holiday at Magaluf. The magazine is printed in London, and has been from day one. This may seem rather strange, but it is not for the want of trying to have it printed in the town. Indeed, the town’s two biggest printers are run by avid Pools fans, but neither can touch the price of our printers in Catford. In spite of the distance, they always come on time – although there have been a couple of close calls. When we played Arsenal in the League Cup, we had a special edition for the home game. I rang Catford on the Tuesday morning to confirm that they were on their way, and they said "No problem, you’ll have them for the match tomorrow night." "But we’re playing them tonight." I said!! Catford kindly put them in a taxi to Kings Cross and sent them up to Darlington Station by Red Star parcel. I picked them up at about 5.30 pm and they were on sale outside of the ground by 6.15. We also had a new edition out for the famous friendly against CSKA Moscow in 1990. My little blue book shows the attendance as 671, and I sold nearly 300 copies that rainy night. I reckon that must be some kind of a record for sales of a fanzine as a percentage of a crowd. Selling at away games was sometimes a little difficult as various grounds ban such activities. I remember being stopped by stewards at Cambridge, so we ended up selling copies in the Gents toilets, once word got around that a new issue was available. We’ve had our moments over the years. Garry Gibson threatened to sue us (amongst other things) and banned us from the club shop. He never said no to the sponsorship money though (although towards the end of his reign, we withheld the cash until after the take-over) We had a period during Harold Hornsey’s reign when everything seemed to have been fixed and no-one had anything to complain about – although that didn’t last long. Bob and Lol have now taken up the reins, and I wish them every success for the future. Seeing issues 48 and 49 come out with no content or indeed input from myself was a slightly surreal experience. One of the great pleasures of producing MB over the years was seeing people on the terrace reading their copy, with huge grins on their faces. No doubt MB will continue to evolve over the seasons, and I look forward to enjoying each issue with the same satisfaction as many of you have over the years. Sadly, Paul Mullen died at the start of the 2004-2005 season after a long illness. 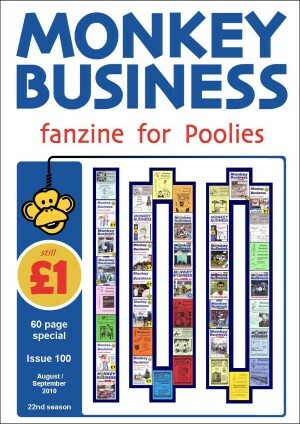 That period also saw the introduction of a full-colour cover, which helped to further increase sales to around 700 copies per issue, and MB was financially secure. However, the same period also saw several changes of editor, but finding replacements for this onerous position became a regular problem for MB. 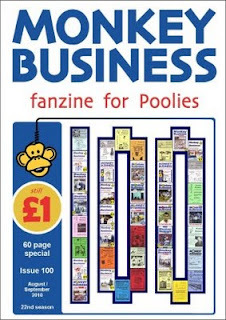 Added to that was the need for a team of sellers to go out in all weathers, plus the fact that MB was now one of the few remaining printed fanzines in an increasingly online world. So, during season 2010/11 it was decided to cease publication of MB as a printed magazine, and publish it online, in a team blog format, which would require no selling, and almost no editing. 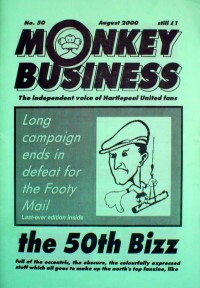 Our printers had at one time produced many of the country's football fanzines, and MB was their last, so it was the end of an era for them as well as for us. The online version has managed to go monthly, coming out on the first Friday of every month, and introduced a linked second website for match reports coming between editions. For the second online season, this was combined into the main site. Our spoof brand name BizzCo even has its own website (www.bizzco.co.uk). Several of the current contributors and production team were involved in that first season, and a large proportion have been with us for most of the history of Monkey Business, and still continue in the online era.